but......very caught up around the office......and the yard.......and the garage.....fresh line, top shots and leaders on the tarpon rods. Today is the first pretty day in a week so the texts and phone calls are coming in with reports of tarpon in the river and the sound. The boss is coming home today from her travels, she'll have a list of honey-do's for me to follow up on. If those tarpon reports keep coming in, I imagine that my case of cabin fever is going to be severe. Lots of inquiries for fishing yesterday and I had a crew set up, but the wind looked a little blustery so I pulled the plug on chasing tarpon. Now that the tackle is organized, fresh line on everything, new "top shots" and bags of circle hooks on leaders, I'm getting a little ancy. We may have a few days next weekwith a favorable forecast and fresh bait. 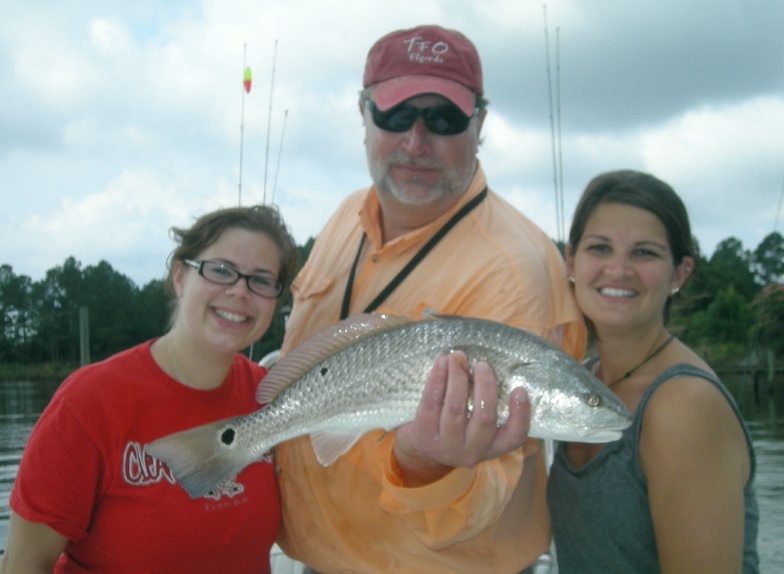 Keep an eye on the fishing reports, there may be some "make up charter" opportunities to share the boat. My crowd for Thursday fell through. I've got bait lined up and want to put one in the air, anyone up for it? Shoot me an e mail, info@pamlicoguide.com Maybe we can put a couple of guys together for a make up trip. Dad and I took a float trip down the James today, Joshua Falls was the best of it. Check out this months NC Sportsman and the article about crossover fishing. I put a Mirror Lure MR-17 to work and gave dad a lesson, catching 4 smallmouth to every one that he landed. No worries, he returned the favor in his childhood bass pond this afternoon. He had me about 10 to 1 on the largemouth before I switched over to the green lizard that he was throwing. He then switched to topwater and never let me catch up. I had forgotten how good it feels to give a Roland Martin hook set to take up the lack and put a largemouth in the air... Got to admit, the smallies are more sporty in that swift water. Pretty cool to watch them leap and eat the dragonflies, never seen that one before. Packing up and heading to the coast to put another fish in the air sometime this week. First Tarpon of the year!!! Congrats to Capt. 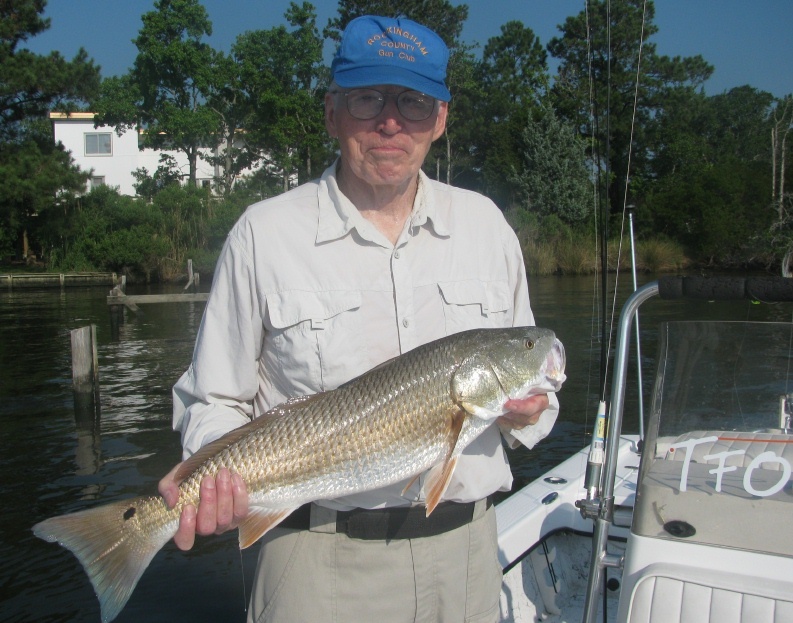 Phil Ambler and Capt. Gene Wooster who caught the first tarpon of the year today. Their exploratory expedition worked out just right. Will be out there to get mine later in the week. 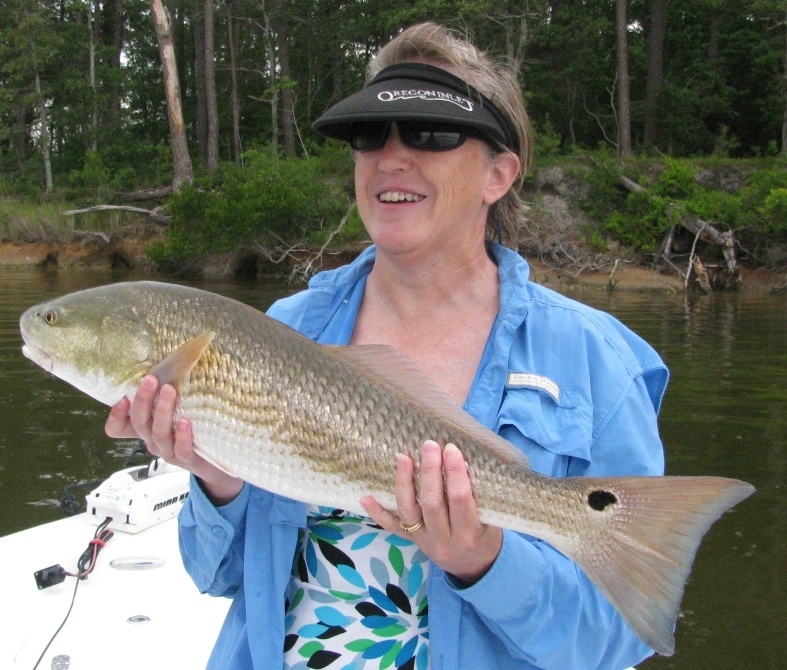 "Puppy drum fishing has not been automatic so far this summer. We've had good days with slot and even a nice yearling fish. Much of our fishing has been sight casting to fish, mud's or wakes. We've also landed a number of nice sized keeper flounder and plenty of small specks with an occasional keeper in the mix." 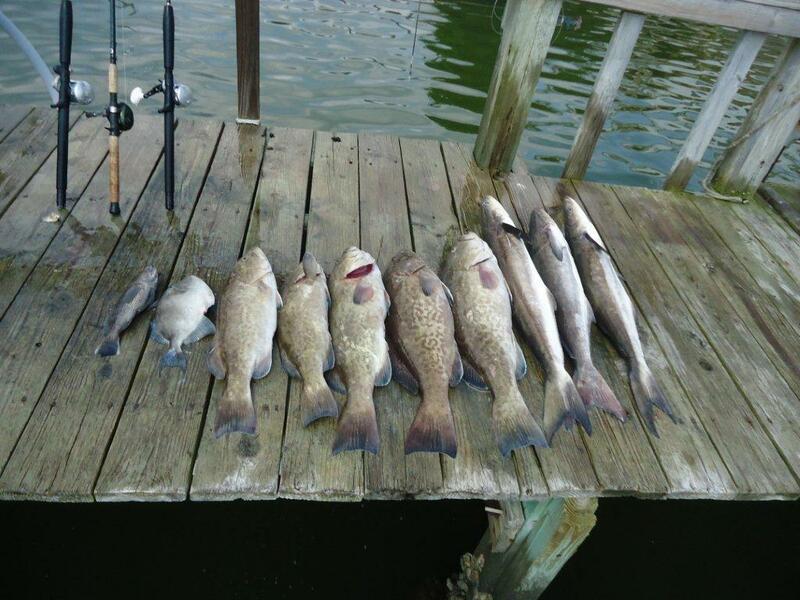 Then today he sends me...."16 slot pups today, loss a few, a handful of small specks, and a few flounder with a nice keeper." That sounds pretty automatic......for me, I'll be following up some rumors of silver in the river that are floating around. After two months hard at it, I'm going to see if the stream up in the mountains is still cold enough that I don't have to get up from my strategically placed lawn chair to get another cold Budweiser......I'll let you know, but I suspect things will be just right. Tarpon have arrived and I'm going to be on 'em hard when I get back. Capts. Ray, Greg and Dave Stewart are picking up the slack while I'm gone. My buddy Anthony Ng is in the running for getting on the cover of Saltwater Sportsman courtesy of a cool photo from Ric Burnley, how about checking this out and putting in your vote for the Virginia Kings Cover? Today started out with catching a keeper cobia before we got out of the Turning Basin in front of the port. 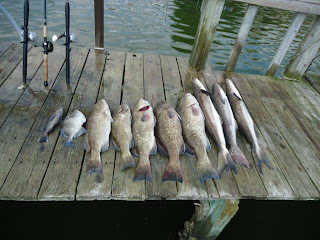 We ran into 4 more and caught them all......at the same time, then we hammered the aj's and played with 9 nice gag grouper up to 20 pounds, sea bass, triggers and other bottom dwellers. Here's a link to a trip a couple of weeks ago. Check out the aj's that cruise by as we're landing the cobia. Captain Ponytail needs your help asap!! Capt. Ponytail here. We need a little help! For those of you who have fished with us or bought bait from us on the Roanoke River in Weldon, I just received the minutes from a town council meeting held in Weldon May 9th. The town council may vote tomorrow night on changing a local permit that would make it illegal for us to sell bait at the Ponderosa Campground. This would affect our bait business and our guide business as well. 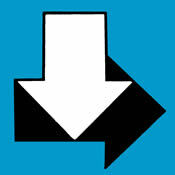 Eight to ten other out of town professional guides also use our services...and most importantly, so have you. I learned about just last night, and the next meeting is literally 24 hours from now on Monday night in Weldon. Smokey, Greg and I will be at that meeting hoping to be able to speak before the vote is taken. Please use your voice for us. If you have had a good experience fishing with us or buying bait from us, please tell the town council and Mayor of Weldon that you would be upset if we were shut down. They have no clue how much revenue folks like you bring to their little town. So please tell Traci Storey,(Town Clerk),Mayor Meacham and the commissioners of Weldon your story of where you're coming from to fish, the fact that you ARE helping the local economy, and how we've helped you to have fun on the Roanoke. Please ask Traci to forward a copy of your e-mail to Mayor Meacham and each commissioner. So please email your comments to us and Traci Storey in Weldon. Her e mail address is tstorey@historicweldonnc.com "
Wish I could make the meeting, but I did send a letter. Rod's bait business has been important to the Down East Guides, keeping us in good bait and our customers in good fish. Capt. Greg got the dolphins yesterday and a big 48 inch drum in the river the day before. Won't be long before I'm in the dirty water. After catching over 80 cobia this season, I lost the first one right at the boat, the 40 pounder left with a little scratch on the head, the 20 pounder came back to Atlantic Beach with us. A couple singles came up with the aj's, caught plenty of them including some cool popper bites. The mini streak was broken today. No cobes. Did get some aj's, a gaffer dolphin, groupers, bass, triggers and odds and ends. Here is some video from last week. Pretty funny. Including a 54 pound cobia and her mate, we kept the streak alive and caught 10 different species of fish today. Lot's of good table fare. A cobia a day keeps the streak alive, but they're getting fewer and smaller. Not too bad if you are catching them on "bass tackle" which also took an amberjack. More aj's on poppers and an assortment of bottomfish, big bluefish and odds and ends made for a decent day. This was a good one, a 50 pounder that we pulled off a tideline in 80 feet of water. Seems like a lot of fish are passing us by, but there is still a trickle of cobes around. I just got the light tackle king rods rigged up, just seeing too many of them sky in bait balls not to give them a try. Nearshore wrecks are still loaded with the aj's. Plenty to fish for down here on the Crystal Coast. Capt. Joe Shute was getting the pups on the fly today, despite the NE blow that we had this morning. I wouldn't call it a streak, but we have caught the cobia every day for the past week.....including on my bird watching trip yesterday.